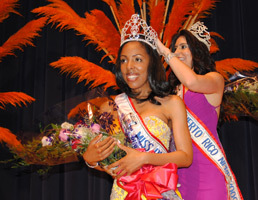 Registration Fee – a $250 registration fee is required to compete in the Miss Puerto Rico-NPRP pageant. To reserve your place in the competition, a non-refundable $100 deposit must be submitted. All registration fees and completed documents are to be submitted by April 30. Pageant Tickets – Each contestant is responsible for selling 10 tickets. Backstage Rules: No parents, family members or friends will be allowed backstage or in the judge's room during and before the competition. Rehearsal Clothes – It is very important you bring comfortable informal clothes, such as a T-shirt and shorts. We also ask that you bring the shoes you will use during the competition. 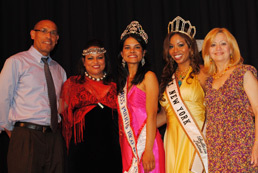 At the Miss Puerto Rico-NPRP Pageant there are four areas of competition: Private Interview, cultural components, Evening Wear, and Onstage Question. Private Interview – Contestants should wear a business suit or cocktail dress for this segment of competition. You should look sophisticated, elegant and professional. Please do NOT wear hats, gloves or purses. Presence and Poise in Evening Wear – We feel you will use good judgment in selecting your wardrobe for the pageant. In choosing your eveningwear, keep in mind that it should represent who you are. This will be your time to shine by demonstrating poise, beauty, charm and elegance. Cocktail dresses are not permitted as eveningwear during this phase of competition. Hairstyles / Makeup: We recommend natural hairstyles that will last throughout the competition. Cameras are extremely sensitive, especially with skin tones and coloring. Help will be available to you in the dressing room. On-Stage Question The On-Stage Interview phase of competition is designed for the contestant to make an on-stage statement of her interests, opinions and aspirations. Two questions will be asked, one English and the other in Spanish.